Alexis and I had the perfect excuse to try out our new found skills in sushi making when we went to a party at Scooter Works in Waterloo. It’s a fantastic little gem hidden away on Lower Marsh behind Waterloo Station. It’s a retro bar with amazing character and you are allowed to bring your own food. First came the rice, it’s not too difficult to make as long as you don’t forget about it. I followed the instructions I got from the sushi making classes at Suzu’s and it was perfectly sticky. Wash the rice a few times and then leave to dry in a colander for about 30 minutes. Then in a pan add the rice and water, cover and leave on a low heat for 10 – 12 minutes or until steam comes out from under the pan’s lid. Turn off the heat and leave for about 15 minutes and then mix in the vinegar. Leave the rice to cool. The chef at Suzu explained how she got her children to pick what they wanted to put in their sushi and they came up with weird and wonderful ideas that tasted really good. She encouraged us to be daring. We decided not to use any fish and so made a few unusual sushi such as chicken, mayonnaise, avocado and red pepper or brie and cucumber or the simple vegetable sushi. I see sushi a little like sandwiches, that you can put anything in them. Sushi rice is very very sticky and the most annoying thing is to have it sticking to your hands and not the seaweed. Wear some latex gloves and rub a bit of sesame oil on to avoid it sticking. Get your rolling mat out and lay the seaweed on it, have the rough side of the seaweed up. Take some rice (a tip from Suzu’s chef is about the size of an egg) and spread it out evenly on the seaweed (leave about 1 cm of seaweed along the top). Lay the thinly sliced ingredients along the centre of the rice covered seaweed sheets and fold the seaweed over the ingredients and roll. You must do this quite firmly. Once you have your sushi roll cut it into slices of about 4cms. Get your rolling mat out and lay the seaweed on it, have the rough side of the seaweed up. Take some rice (it’s a medium avocado this time). Make sure the rice completely covers the seaweed and the turn the sheet over so the rice covered side is facing down. Lay the thinly sliced ingredients along the centre of the seaweed sheets and fold the seaweed over the ingredients and roll. 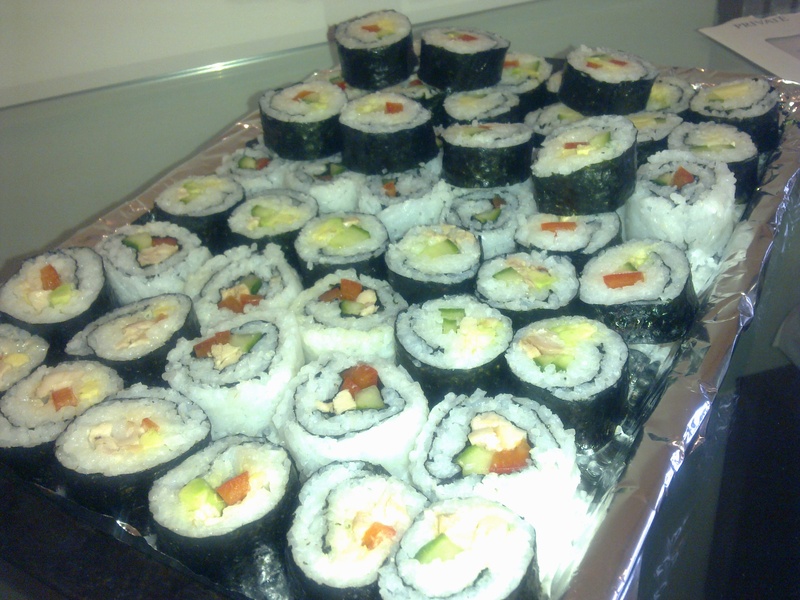 These will be a bit thicker than the Maki sushi so you can cut them a bit thinner. Sushi is great dipped in soy sauce and a bit of wasabi. I hope this has all made sense… any questions let me know. Since Alexis and I have been together he’s been getting more and more into cooking. As he loves sushi I thought that for his birthday we’d go to a sushi making class. It was fantastic, and I’d recommend anyone living in London who enjoys cooking to go to Suzu’s in Hammersmith for its 2 hour class. 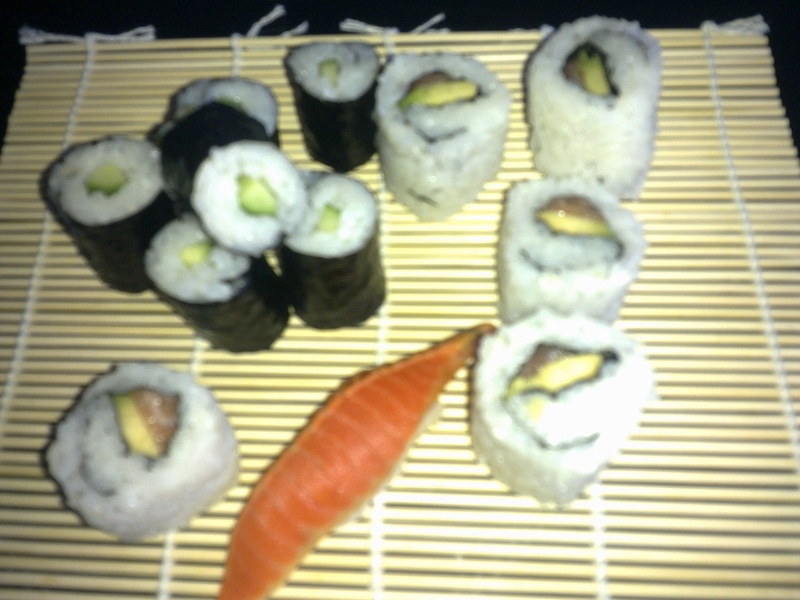 It was relaxed and inspiring and well I walked out knowing how to make maki sushi, nigiri sushi and californian rolls. We made a total of 24 pieces each so ate about half whilst there and had the rest for dinner. I’m not going to go into how they were all made as I think I will try making them at home again as I want to try and be creative and fill them with yummy ingredients.